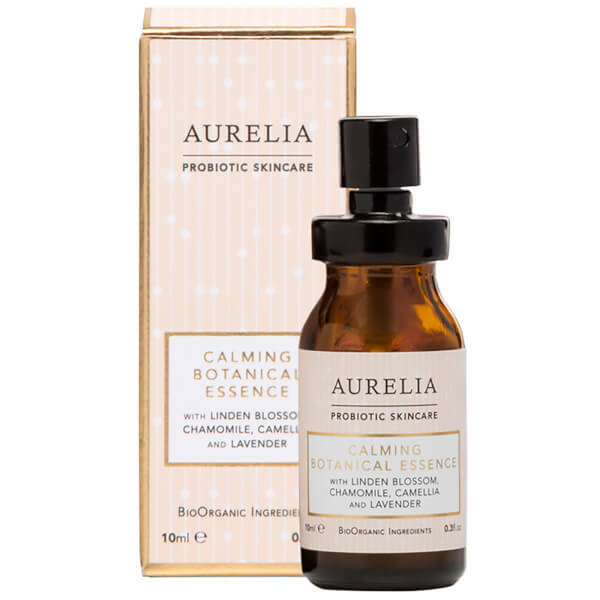 Cope with daily stresses using the Aurelia Probiotic Skincare Calming Botanical Essence; a lightweight facial mist that boasts the power to protect and balance skin, as well as offering calming properties to both the skin and mind. The facial mist is infused with filtered Glacier Water sourced from natural springs. Packed with curative properties, the water helps to hydrate, purify and balance the complexion. Suitable for all skin types, the essence utilises the therapeutic benefits of Rose Quartz Crystal Water to calm the mind and relax the senses, encouraging an inner feeling of peace. Complete with a calming blend of essential oils and Fragonia, the comforting mist offers a deeply relaxing experience that is able to eliminate feelings of jet-lag, ideal for frequent flyers, restless sleepers and new mothers. Expect to feel and appear calm and de-stressed. Aqua/Water/Eau, Bifida Ferment Lysate (Probiotic Culture), Lactobacillus, Lavandula Angustifolia (Lavender) Flower Oil, Cananga Odorata (Ylang Ylang) Flower Oil, Tilia Cordata (Linden) Flower Oil, Pelargonium Graveolens (Geranium Bourbon) Flower Oil, Juniperus Virginiana (Cedarwood) Wood Oil, Boswellia Carterii (Olibanum) Gum Oil, Anthemis Nobilis (Roman Chamomile) Flower Oil, Agonis Fragrans (Fragonia) Branch/Leaf Oil, Anthemis Nobilis (Roman Chamomile) Flower Water, Rosa Damascena (Rose) Flower Distillate, Santalum Album (Sandalwood) Wood Oil, Cocos Nucifera (Coconut) Fruit Extract, Argania Spinosa (Argan) Kernel Oil, Calendula Officinalis Flower Extract, Camellia Japonica (Camellia) Seed Oil, Quartz Powder, Xanthan Gum (Naturally Derived), Lactic Acid (Naturally Derived), Lactose (Probiotic Bifidoculture Milk Extract), Milk Protein (Probiotic Protein), Whey Protein (Naturally Derived), Rapeseed Acid (Naturally Derived), Citric Acid (Derived From Lemons), Lysine (Amino Acids), Sodium Benzoate (Natural Preservative), Potassium Sorbate (Naturally Derived), Sodium Chloride (Naturally Derived), Glycerin (Vegetable Derived), Glucose (Naturally Derived), Benzyl Alcohol (Derived From Essential Oil), Dehydroacetic Acid (Ecocert Preservative), *Limonene, *Linalool, *Geraniol, *Citronellol, *Benzyl Benzoate, *Farnesol, *Benzyl Salicylate (*Naturally Occurring In Essential Oils).